When your employees or partners require training, Zunos Courses are the ideal way to get them up to speed quickly on knowledge of products or business practices. With Courses, you can build out bite-sized learning programs with existing content without breaking a sweat. You can upload your content in Zunos and create or import quizzes, then plan out your modules in your courses to be completed in a sequential order. Learn how below. All existing training materials that you have created in Zunos can be reused when creating courses. Easily reuse your content by dragging and dropping your PDF's, videos and images into a Course module. It only takes a few seconds. Make sure your course content is mobile friendly. Zooming in on PDF's on a mobile device is not an ideal learner experience. With Zunos, you can make any of your content mobile-friendly in just a few clicks. You can also easily link to other documents to help your learners on their quest for knowledge. Achievements can be used to further extend the life of your Courses by incentivizing your learners. Set clear milestones for your people and keep them coming back for more by offering rewards along the way. Test new knowledge by creating bite-sized quizzes. With just a few questions you can see how your learners are retaining new information. 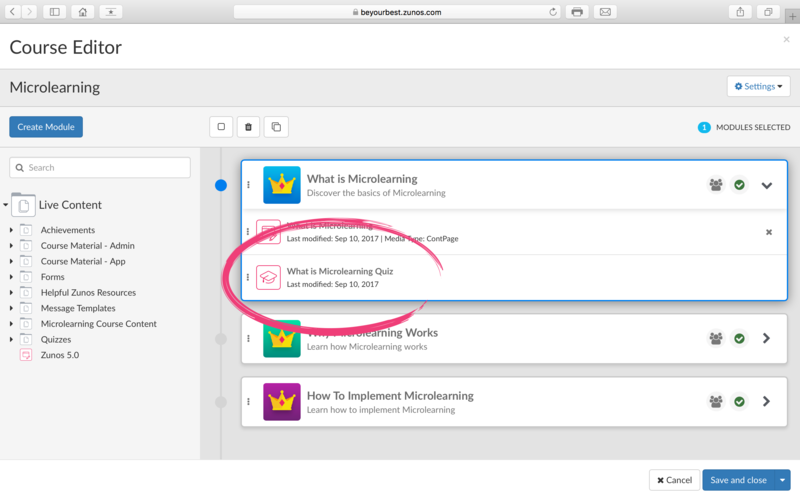 Add quizzes as the last task in a module to check learner understanding and reinforce knowledge. Images make your content appealing and engaging for learners. 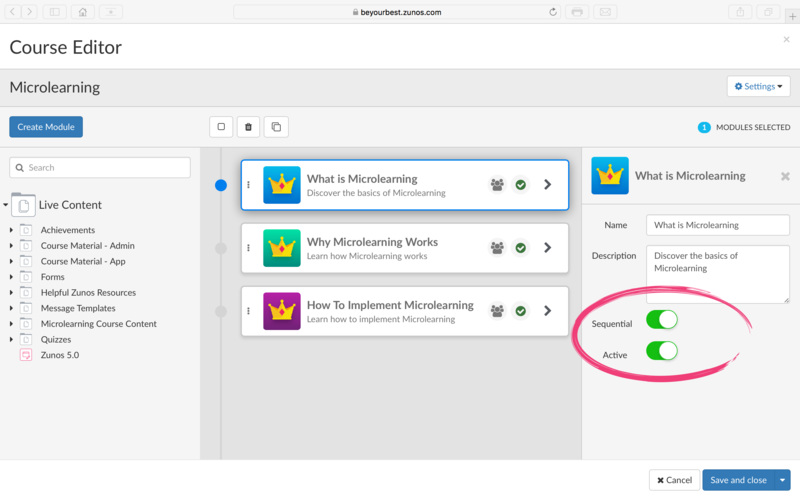 In the settings of your Course, add a compelling banner image which your users will see on the app. The optimal size for banner images is 2208 x 989px. Depending on the device your image is being viewed on, some cropping may occur along the top and bottom when the tile is stretched across the screen. To avoid distorted images, we recommend you use images with no words or logos, and skip the light or white images. The course icon should by 192 x 192 px and appear circular on the app. And finally, the module thumbnails should be 114 x 114px. When naming your content and quizzes in Zunos, add the type of content it is at the end of the name. eg “ Creating Audiences in Zunos Tutorial Video” or “User management in Zunos PDF”. This will give your learners clear direction into the content they need to view or download. Keep courses simple and don't add too many tasks in one module. Five is more than enough. Always add quizzes to your modules as a knowledge check to reinforce important information. Courses consist of modules and tasks. Each module contains tasks that users need to complete, such as viewing content or completing quizzes. Learn how to create courses here. When published, Courses are automatically added to a course library in the app. If you have important information you need to get out to your learners, ensure it doesn’t get lost in the shuffle of other Courses by making it a Featured Course. When a Course is featured, it will be added to the user’s to-do list under the “My Courses” section. Avoid confusion or missed material by creating a sequence to your Course Modules. This feature is perfect when you need a learner to follow a pre-defined order. To avoid learners skipping over content, do not attach content items to the quiz questions. Instead make content separate from quizzes so your learners take in all the information first and then quiz them after, in order to help build retention. Add Course and Module Descriptions. It helps the users to understand what they need to do and assists them on their journey through the course. Add important or mandatory Courses to the learners 'My Courses' list. It will remain as an outstanding Course in their list until it's completed. Courses which are not mandatory will be added to the course library and be considered as 'optional' to complete to your learners. You can further push the importance or urgency of completing a Course by sending out a push notification to your learners which link to any Course you choose. Learners can keep track of their Courses in their “Course List” on the app. A blue progress bar shows them how close they are to completing tasks. When starting new Courses, learners can gauge time with the clock symbols, which indicate how much time the Course will take a user to complete. Note that 1 clock indicates a short course and 3 clocks indicate a long course. Learners can look through the library of created Courses and add non-mandatory Courses of interest to their “to-do list.” This allows users to take charge of their learning, and expand their knowledge in other areas that interest them. In the settings of every Course you can indicate how long the Course will take with clock symbols. Add these so your learners can prioritize their time throughout the day and complete courses without interruptions when it works best for their schedules. View the progress of your learners via the module progress button in the Admin Portal. Do this often to determine whether you need to send out a reminder email or push notification. For deeper insight, view the performance of your learners in quizzes and run or automate Quiz Reports. Request feedback on your Courses by building a simple feedback form in Zunos. Link the form to a message or push notification letting your learners know it's available, and asking them to give feedback on course material and structure so you can continuously improve the experience. It’s time to build your first course. Visit these helpful articles listed below for step-by-step instructions, then login to the admin portal to get started. Need some inspiration? We have courses ready to complete in the Zunos Be Your Best account and you can request access here.